This program started as a simple FFT program running under DOS a long time ago, but it is now a specialized audio analyzer, filter, frequency converter, hum filter, data logger etc (see history at the bottom of this page). You can download it from this site. Or look into the manual though the manual included in the archive will be more up-to-date. If you are looking for a short description in German language, look here . Input can be taken from the soundcard, but the "audio utility" interface makes it possible to create an interface to any A/D converter you like (for example a PIC with serial interface). A plugin for Winamp allows to analyse audio streams from the internet (see download section). Variablee frequency range, adjustable during analysis, the old part of the waterfall display will automatically be re-drawn without stopping the audio processing. 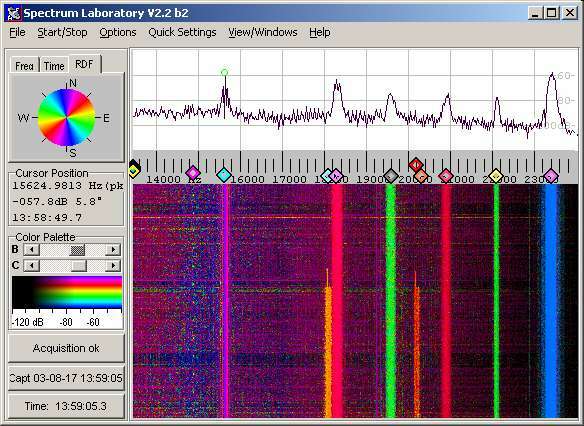 Special waterfall mode for "Radio Direction Finder" with colour-coded azimuth display, based on DF6NM's Wideband Direction Finder with Colour Encoded Spectrogram Display. Now with up to three "notches" (adjustable nulls in the synthesized antenna pattern) to suppress noise from certain directions. Audio sample rates from 8000 to 44100 (or 48000, or even 96000) samples per second. Frequency resolution in the sub-milliHertz range (exceeding the stability of the soundcard's clock generator). Audio filter with user-defineable coefficients plus FIR- or IIR-filter designers (up to 128th-order filters), or filter with FFT convolution since December 2003. Hum filter to remove 50 Hz (or 60 Hz) plus harmonics, based on Paul Nicholson's algorithm for a multi-stage comb filter with automatic tracking. If you are interested in improving your Natural Radio reception, read Paul's Notes on Domestic VLF Reception. Frequency converter to shift low "IF"-frequencies (e.g. 17.2 kHz) to audible tones (650 Hz, etc) in real-time. Can be used in a 'soft-VLF-RX'. Other demodulators in DSP-blackbox. Decoder for some time-code transmitters: MSF(60kHz), HBG(75kHz), DCF77 (77.5kHz) can now be used to set your PC clock to a high accuracy. All you need is your longwave receiver and the soundcard. Modulator and decoder for some 'experimental' digital communication modes like PSK31, BPSK, QPSK, FSK, multi-tone HELL, MSK (minimum shift keying since 2004-12), transmission and reception of letters with a small 'terminal' window. A DLL interface is available to use Spectrum Lab for new digital transmission modes (but not in use yet). versatile export function (text-file based, for post-processing with Excel etc.). Brian, CT1DRP has used the export functions to create spectrograms and signal graphs of the 136kHz band. Communication with other applications through a simple message-based system, which is also used by SpecLab to communicate with the RDF calculator (range-and-bearing calculator + map plotter). Due to its 'Laboratory' nature, this analyzer is not as easy to use as ARGO (by I2PHD and IK2CZL, available on Alberto's homepage: www.weaksignals.com ). How to use Spectrum Lab to produce field strength plots of DI2AG, an experimental medium wave beacon on 440 kHz in southern Germany. It realizes some ideas we spoke about at the Ham Radio fair in Friedrichshafen (June 2005). More info in this document (up to now, in german language only) : Beschreibung des Einsatzes von Spectrum Lab als Bakenlogger für DI2AG. The installation package is divided into small pieces because my old internet connection failed quite often. There are several alternative sites with possibly better bandwidth, but not necessarily the latest "beta" version; see below. For some stupid browsers, you may have to RIGHT-CLICK the following links to the zip-file and then select "save file.." (or similar) from a popup menu. Note: Forget about the download from QSL.NET : I don't update the files there any longer ! As an alternative, check the download section on Ko Versteeg's website . How to install SpecLab from these two files is explained here . The archive includes EXE-file, sample setting files, help system (in HTML format) and a few other goodies. To run some of SpecLab's companion programs (like the RDF calculator, but not for SpecLab itself), you may have to download Borland's VCL40.BPL from this link. It's quite large (1.9 MB unpacked), so I threw it out of the application package. After downloading the file, unzip it and copy VCL40.BPL to your windows system directory (c:\windows\system for example) or into the directory of the application which needs it. Note: The link may be temporarily unavaible due to cancelled AOL membership ! If you want to write your own program to control Spectrum Lab, read this document which explains how to communicate with it using simple WM_COPYDATA messages. There's a lot of other very nice sound analyzers elsewhere, but once upon a time (when there weren't so many out there) I decided to convert my old FFT audio analyzer from DOS to Windows ... see oldest entry in the history below). Some info about the revision history can be found in the file REVISION.TXT after unzipping the downloaded archive. August: The radio-direction finder can now suppress noise from up to three independent directions, and a new spectrum-event-logging feature was added (right-click into the waterfall to see it). July: Wrote a highly experimental "output plugin" for Winamp, to feed audio streams from the internet into Spectrum Lab. June: Some modifications, bugfixes, and a description how to set up SpecLab as a beacon monitor/logger for DI2AG . Added an optional quadrature output for certain digimodes (QRSS, PSK, MSK) to support a simple, sideband-rejecting RF modulator (using the "phasing method", without the need to build a 90° audio phase shifter which is often the most complicated part of such a transmitter). Finally bought an Audigy 2 ZS myself, to play a bit with "true" 96 kHz sampling (for ADC+DAC), and -possibly- with 24 bit resolution. I still don't know why they need 24 bits to achieve an SNR or 108 dB, but that's another story. Futhermore: Automatic gain control in the DSP blackbox, an external trigger for the waterfall, and a few new display units (volts, watts, dBm, dBV). Averaging now calculated on voltages or powers, but now on logarithmic scales (which gave no meaningful "dB"-results). Furthermore: Published the method to control SpecLab from other programs using a simple message-based protocol. Logarithmic frequency scale, modified PSK demodulator, modified noiseblanker, minor bugfixes. Someone reported SMPORT (the port access driver) caused problems under WinXP - effect not reproducable yet ! Got the info that the ADC in my Soundblaster Extigy does NOT support sampling at 96 kHz - I shouldn't have trusted the label on the box :-( ... but help is on the way: SpecLab works well at 96kHz with the Soundblaster Audigy 2 ZS card - thanks for the report, Arthur. New functions: Filter with FFT convolution, for extra-long FIR filters, denoiser (using spectral subtraction), and a brute-force autonotch for VLF listening. Optional peak-detecting amplitude bar which runs parallel to the spectrogram. New function for SINAD measurements. Minor changes and bugfixes. Tolerance range for the soundcard's "calibrated" against the "nominal" sampling rate is now +/- 250Hz (was +/- 100Hz) because some devices seem to run at 5400 Hz instead of 5512 Hz. Azimuth calculation of very weak signals improved. Cursor display now alternatively in menu line, if the controls on left side are invisible. More steps towards a full implementation of DF6NM's Wideband Direction Finder with Colour Encoded Spectrogram Display in Spectrum Lab. For VLF enthusiasts, there is the option "two loops without an E-field antenna" which does not require a broadband 90° combiner. A nulling cardioid can be used to cancel noise from a certain compass direction. The description of an experimental VLF radio direction setup can be found here . Increased the maximum waterfall scroll/update rate. Up to one pixel strip per millisecond is possible, if your PC is fast enough. Best in "non-scrolling" mode (like in the prepared "Tweek/Sferics" mode). Minor changes in the "plotter" window, can be scrolled back and forth along the time scale. Used for long-term observations (like the "VLF station plotter" which plots the field strength of a number of european VLF transmitters over time). Added some usr-files for ELF/VLF monitoring. Implemented Paul Nicholson's multi-stage hum filter in SpecLab's DSP blackboxes. This specialized comb filter can remove hum (and harmonics) without seriously degrading the audio quality. The current implementation is based on Paul's "C" sourcecode for Humfilt-1.2, it was available on his website. Spectrum Analyzer runs in "stereo" mode now. The border around the "Watch List / Plot Window" can be turned off. A lot of internal modifications, may have added more bugs... the programs seems to remain a building site. Many of the new functions are not mentioned in the manual yet ! SpectrumLab now supports 'any possible sampling rate', which was necessary for an external PIC12F675-based A/D converter connected to the serial port (2 channels, 12 bits/sample, 2500 samples/second). Also fixed some bugs in the export function (last definition line was ignored) and the analysis and playback of stereo audio files. SpectrumLab can now use the simple file-based "sound utility" interface described in another document. This makes it easy to write simple drivers in any language for external A/D-converters, etc. Even a BASIC program running in a DOS box should work. And: split frequency axis, effective voltmeter ("veff"-function in the interpreter), improved file analysis features. Early 2000: Started to convert my old spectrum analyzer for DOS into a windoze program, because the required drivers for soundcard and SVGA card were not available any more. Now the program requires a quite fast PC (a 133-MHz-Pentium or better), crashes under certain conditions (slow CPU), and requires some strange DLLs. The graphics mode should be at least 800*600 pixels with 256 colors (true color required for Colour Direction Finder). The program once ran on an old 90MHz-Pentium with 640*480 pixel display if not too many DSP functions are active on the same time.